I have been getting a lot more into hair this past month and have been changing up my normal natural curly/wavy locks. I haven't done anything drastic to my hair, just changing the style either with a side braid or twist to get my hair out of my face, using styling tools or attempting a waterfall braid. 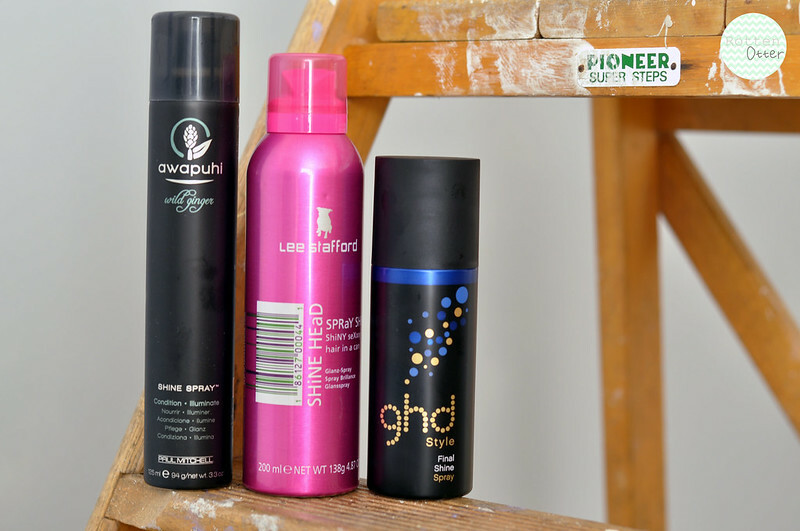 I was recently sent the ghd shine spray which sort of spurred on this blog post as I already had the Paul Mitchel one and thought it would be a good chance to compare all different price points. 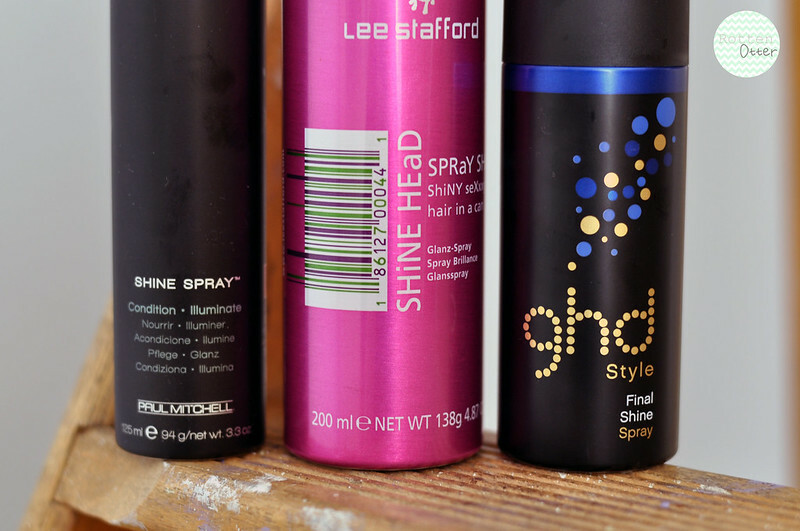 I have to be honest, before writing this post and testing out the products, I wouldn't have thought about using a shine spray but I've definitely changed my mind. So the three shine sprays I'm going to be comparing are Paul Mitchel Awapuhi Wild Ginger Shine Spray* (now going to be referred to as PM for ease), Lee Stafford Shine Head Shine Spray (LS) and ghd Style Final Shine Spray* (ghd). Packaging // My favourite packaging out of the three is by far PM. It looks sleek and I like the colour scheme used. Although I'm a huge fan of pink, the LS bottle just looks a bit too young. I'm also being extremely picky here but the mix of lower case and higher case letters just annoys me. It's like when people WrItE lIkE tHiS. One of my pet peeves. I'm also not a fan of the ghd packaging, it reminds me of a bottle of Lynx. Scent // There is no doubt about it, PM has the best scent out of the three. It's almost like using a hair perfume as it has a lovely wild ginger scent. The only downside to this is if the ginger scent doesn't go well with your perfume. LS has the standard Lee Stafford scent which always takes me bag to being 16 as I used the heat protector from the same range. It's not a scent I can describe but if you're used Lee Stafford products before you'll now what it is. It's nice but can sometimes be a bit over powering. The ghd spray has a bit of a scent, just reminds me of hair products, but it's quite subtle so wont mix with my perfume which I like. Shine // The PM spray gives the most amount of shine out the three. It really makes the golden shades in my hair stand out and makes it even more noticeable when out in the sun. This is the only one which claims to condition the hair as well and I did notice a difference in how my hair felt. The LS spray actually doesn't give any shine to my hair which I was really disappointed about until I properly looked in the mirror and noticed how it tamed the frizzy mess which was my hair. For the past week we've had amazingly hot weather but my hair hasn't liked it and is more frizzy than normal. This spray has actually managed to tame it which was a complete surprise. I can usually sort out the frizz with a bit of oil but it can sometimes look a bit oily so this spray cancels out that problem. Definitely going to be keeping a bottle of this around the house for a while! The ghd spray gave a good amount of shine, not as impressive as PM but better than LS. It also tamed fly aways and frizz but did leave a bit of a residue on my hair. This isn't such a problem for me as I have very dry hair that doesn't get greasy easily so a bit of oil is probably good for me. For people with oily hair, I can see this not working for them. Price & Availability // PM is the most expensive, £18.95 for 125m and isn't readily available. You can buy it from amazon for a higher price or find a salon near you that stocks it. ghd is £9.95 for 100ml and LS is the cheapest, £5.49 for 200ml and is found in Boots. Surprisingly, there isn't an obvious over all winner which I wasn't expecting. They all have their pros and cons. My winner is going to be the Paul Mitchel spray because of the amount of shine it gives but I wouldn't be willing to pay nearly £20 for a new one. I think once these three are finished I'll try a different brand. ghd have just started to feature hair style videos on their site which has been helping with my much needed hair inspiration. I've also been searching Pinterest and pinning to my hair board to find a style I like. It's given me a kick in the bum to actually go and get my hair cut into a proper style. At the moment it hasn't got any layers and my side fringe isn't really a fringe anymore, it's at that awkward length. I'm currently switching between keeping my hair long like it is at the moment or to go shorter. I keep on telling myself though that I'll instantly regret it if I do get it cut shorter, I always do! I have the Paul Mitchell spray and I love it, mainly because of the scent!